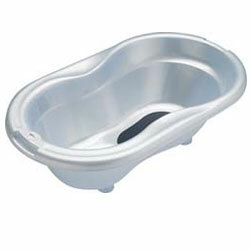 ﻿ BABY'TEMS: Bath tub rental - in Paris and in Ile de France. DescriptionEnjoy bath-time in good and comfortable positions, even while on holidays with baby in France. New born side with mattress, 1 side sited baby. Suitable from birth to about 2 years old. Have you ever tried bathing baby in a sink or a shower? Your friends might not be equipped for baby's bath. So simply rent this Babymoov baby bath together with your stroller hire or your cot hire and get it delivered to your place. Baby (and his parents) will enjoy his bath...even on holidays! The response was quick and the products in excellent condition. The service provided for delivery and pick up was excellent even with the short notice we provide. I highly recommend Babytems to anyone thinking of hiring any baby products. Excellent service! Thank you.